Great men throughout history have sequestered themselves in rugged and gentlemanly studies. We may not have a study (hell, barely a bedroom at this point) but we can still create a place that feels cultured and thought-out. Let’s face it, decorating our apartments can be a daunting task. It might not be an appealing task, either. But if you ever have guests over, you owe it to them to at least make an effort. There’s no need to panic at the word “decorate,” though, because today we’re going to lay out a simple plan for creating a stylish and affordable new bedroom. The room that we will be using as our inspiration is open and spare, but has a warm, inviting feel. An alluring bedroom is always important. First, let’s talk about color. Many of the accent colors in this room are neutral, letting the bright red hues stand out prominently. And using one bright color as the focal point, red in this case, will draw your eye to the details in the room. Red is an easy color to match, too – most reds pair well with each other. And second, this room is about placement. Arranging each item in a deliberate way will give the space a sense of style. And there are no tricky do-it-yourself projects required – just purchase the items and position them like the photo and you’re done! As the old adage goes, imitation is the highest form of flattery – so today we are going to use the image above as inspiration to recreate a similar feel in our own apartments. Once it is broken down into manageable, bite-sized pieces, I think you’ll find that it’s really quite simple to create a comfortable, attractive bedroom. And here’s the best part – everything listed below is affordable… most items cost well under $100. Many rentals come with white walls and wood floors, so if that is the case, then you’re already half way there. Most of the componants are available online, with the exception of the plant. Now, there a few finishing touches that will give the room that polished look. Grab a jacket from your closet and display it proudly on the wall. Who would have thought that your beat up old work coat could be decorative? Display an old black and white picture in a white matte and frame so that it blends seamlessly with the rest of the room. Prop it up against the wall instead of hanging it on a nail for an unexpected twist. And lastly, pile a couple of your favorite books on the nightstand to add a personal touch. And that’s all there is to it. You’ve created an inviting bedroom worthy of guests. If you can view decorating as a series of small tasks like buying a lamp or framing a photo, rather than one big overwhelming job, then you’ll see that a small effort can yield big results. Perfect timing – about to decorate the post divorce apartment. One question – the bed, any info about that? I like that rough hewn style. Ikea, I have one just like it. Thanks Dan – guess I would have seen it this weekend – i’ll keep my eyes open. Hi folks. The exact lamp pictured in the “inspiration” bedroom is available at Ikea. I’ve had it for 2 years. Make this a regular series! +1 for making this a new series… I’m also about to have an entire house to redecorate after an upcoming divorce. Just as we enjoy your fashion inspiration, I think an interior design segment would be fantastic. What a great looking room. I’ll be definitely using the blanket over the headboard idea. My fiance and I happen to have two monogrammed throw blankets now (one was a gift, one was something she got for us after popping the questions and realizing her initials wouldn’t even change), and over the headboard would be a perfect place for one of them. +2 on making this a regular series. Would love to see home offices, bathrooms, and man caves. I only really like half of the layout. The flag and hoodie don’t look right to me, and the the OCD in me feels like the picture should really be hanging on the wall. 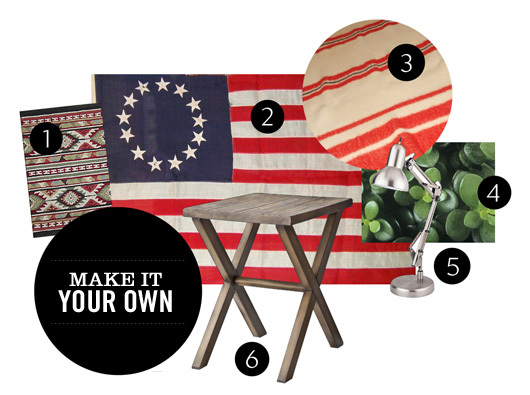 The rest of it, with the bed, table, lamp, plant, magazine rack – all those things rock. This would be a great series. Can I request something on bedding? I’ve been looking for months and am having trouble finding sheets and a comforter that are manly enough and don’t look like I live in a dorm. Does anybody know where I can find this night stand? The link is no longer active. 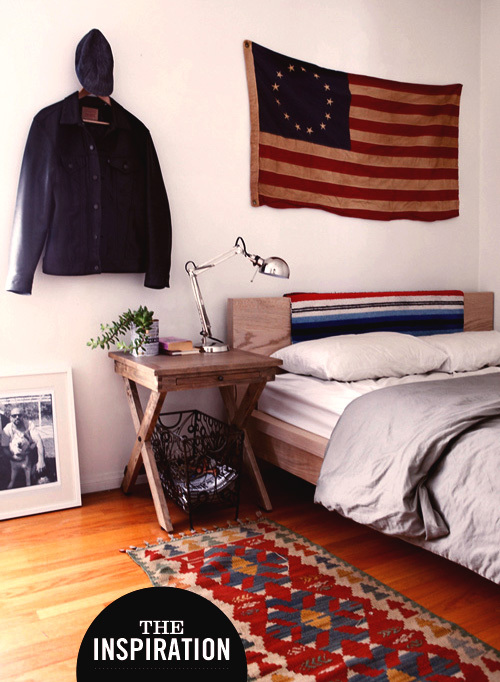 Where could I find that bed frame or something similar?